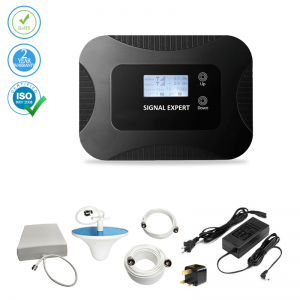 If your carrier is disappointing with its low signal strength, fix the problem by obtaining a cell phone signal booster for the home and be delighted in your coverage. 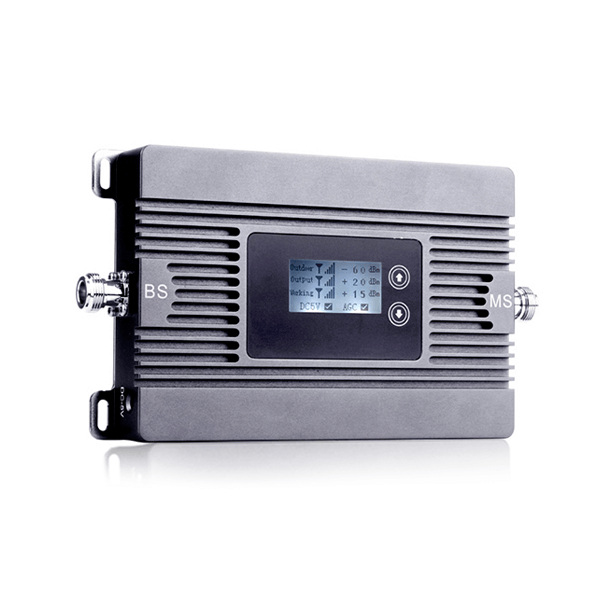 Our quality signal boosters will bring a smile to the faces of your whole family, when there is “enough” power for everyone to use their mobile devices. Our products are created to make your life easier and happier! These can boost T-Mobile, AT&T, US cellular, Verizon signals. 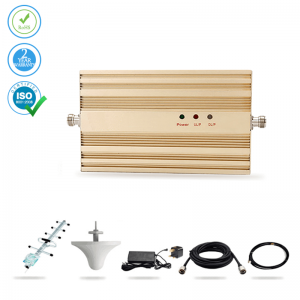 With our cell phone booster for the house, you’ll never be frustrated with poor signal again. Important calls to family and friends are a thing of the past. If you work from home, you will be more efficient than ever. We have signal boosters that work with a variety of U.S. carriers, so you can find just the right one to fit your needs. 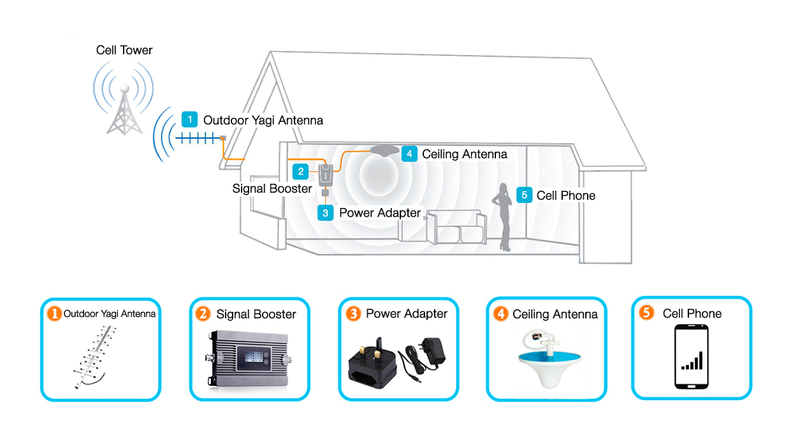 With our easy installation, you can be ready to use your signal booster in just minutes! 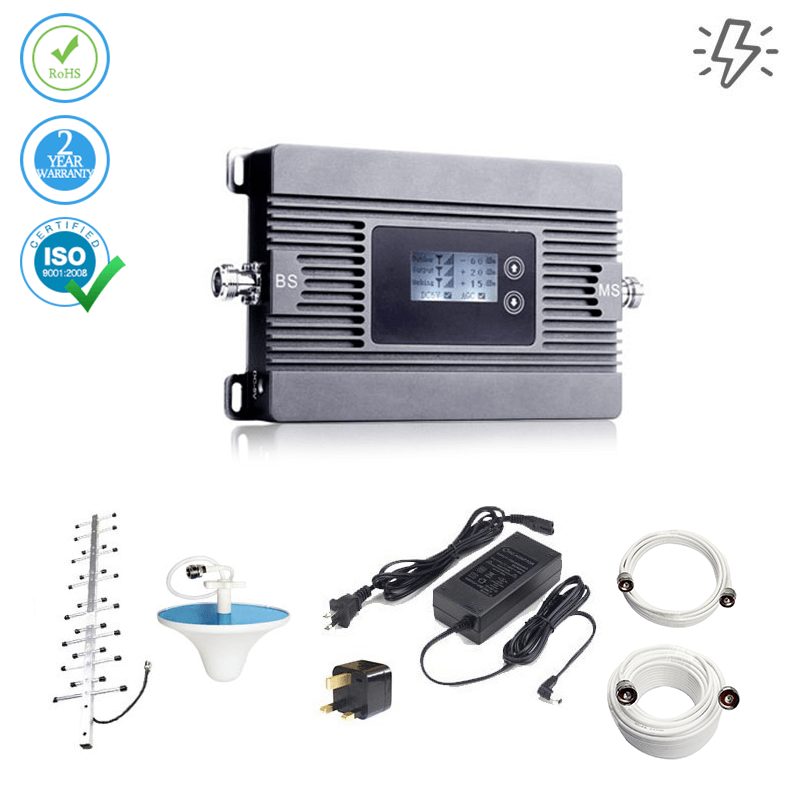 2110-2170 MHz AC:90~265V, 50/ 60Hz;DC:5V 2A 198*138*30 mm. 1 KG. This item does the job perfectly well. Easy to set up with the instructions provided. I would recommend the unit for its simplicity and effectiveness. Very satisfied. Works just like they advertised!!! Our house is situated in a low area so we placed it on the roof and tested it in different positions until we received the strongest signal. We now get 4 bars in areas where we only got 1. 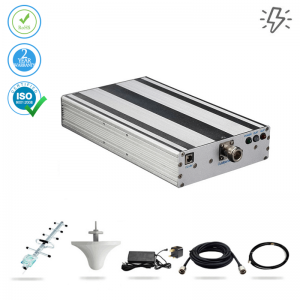 We also tested it in our shop (metal/steel) where we don't get a signal at all and we get 3 - 4 bars depending on how far away from the unit we were. We were having problems with low signal in our home we thought mostly because of the tin siding we have on our house but it turns out after reading their instructions it was also because of the newer double pane windows in our house. We first tried installed it on our window but it didn't seem to help at all when we moved it outside and there were full bars on everyone's phones. The signal booster is worth every penny!!! This product worked just as promised. Much better than anything I tried before. Can even get a signal in the basement that never had signal before. In case of anything with the device, the tech support is always up 24/7. For some reason I got sent completely the wrong product but as soon as I called the helpline an advisor said they would sort it out for me. An exchange was arranged straight away, so apart from the hassle of having to wait a little longer everything was rectified. Now I am able to give instructions to my office while travelling with ease. Awesome, just awesome. It was very easy to install it and it works just fine. Where I used to live I never had any problems with my mobile signal but this new flat must be too far away from the cell tower to get a decent signal. This booster has really helped matters. My daughter was getting angrier and angrier with the poor signal in her bedroom and an unhappy daughter means an unhappy mum. In the end, I decided that this booster could be the solution we were looking for. She's much happier now that she can make calls from her room and I'm happy that she's not moaning at me any more! If you drive the new ford with the aluminum body, you'll have to get a different antenna. Excellent customer service prior to and after the sale. Works great, I own two now for my business inside a metal building. 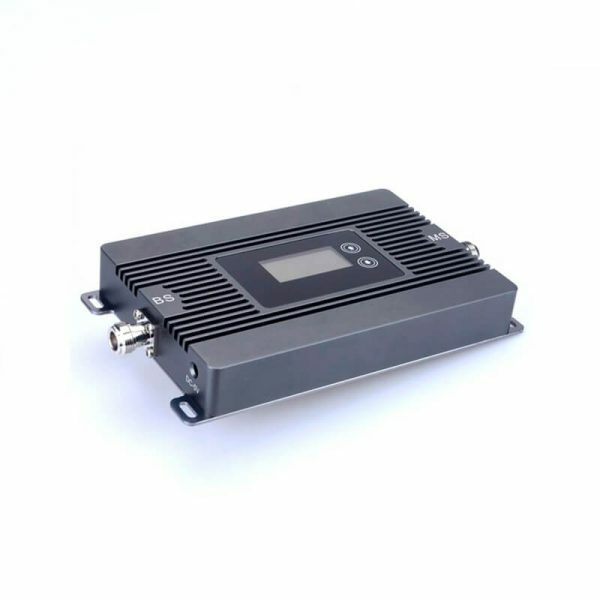 No matter where you're driving, even in the most rural areas, this booster will maintain a reasonably strong signal connection. I'm much happier knowing I'm always connected. Booster gives 5 out of 5 bars in a building that normally had 1 bar of service. easy to install, works well. took me from 1bar to 3 bars. connection in the whole house. best in the closest 2 rooms. the only complaint is that it is half again too expensive. 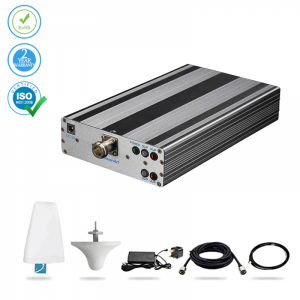 When we converted our basement into a home office we didn't think about mobile signal, so it was a bit of a problem when we discovered it was so poor. This signal booster has changed all that, eliminating the problem. The unit really improved my mobile signal for my house. We have a teen daughter who just won't put the phone down, and she's been whinging on at us to do something about the reception in our holiday home. After she refused to come with us in the half term if we didn’t do something about it we got this booster installed. No more arguments just lots and lots of phone conversations. I'm glad I'm not paying her phone bill! Before I got this, it was once in a blue moon that I'd get a 3G signal in my house. Now, it's there 24/7.